Described as having an “infinitely flexible sound, with many subtle colors,” Jonathan Keeble is among the leading performer/pedagogues of his generation. Known for his rich tone, effervescent personality, and nuanced musicality, he is in high demand as a performing artist and master class clinician. Jonathan’s passion for new music led him to commission many new works for the flute. From these efforts come the recently released, critically acclaimed recordings, Voyage and Song of the Black Swan as flutist in the Aletheia Duo, and Turbulent Winds with the Prairie Winds. Critics have lauded the collaboration in Voyage as being “memorable,” and Keeble’s performance as “spellbinding.” In Song of the Black Swan, his playing is lauded as “exquisite” (Fanfare Magazine) and “Keeble’s depth of tone and palate of colors is magnificent throughout the album. This is a fabulous addition to a ... CD collection, both for the quality of the performance and the diversity of the repertoire.” (Flutist Quarterly) In Fanfare Magazine, the Prairie Winds were lauded for “the players individually and as an ensemble being superb.” These come in addition to his first solo recording, icarus, and Gale Force, ranked among the top fifteen recordings of 2000 by Chicago Tribune critic John von Rhein. 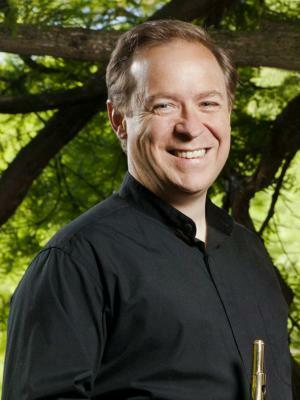 In addition to his active solo and chamber career, Jonathan is the Principal Flute of Sinfonia da Camera, and has performed with the Chicago Symphony, and Kansas City Symphony. Recent tours have taken Jonathan to Mexico City to perform and teach at the National Conservatory, in addition to concerts and classes in Australia, Brazil, Austria, Holland, Serbia, Sweden, Canada and Asia. Tours during the current year take Jonathan throughout the United States and to New Zealand. A popular invitee as a featured guest at flute festivals, recent years have seen appearances as a featured guest at Seattle Flute Society, Chicago Flute Club, Texas Flute Society, and FluteShox events. Jonathan is a Past President of the National Flute Association. Jonathan’s teaching experience includes his present position as Professor of Flute at the University of Illinois at Urbana-Champaign, where he was awarded the Campus Award for Excellence in Undergraduate Instruction in 2016, and the College of Fine and Applied Arts Award for Excellence in Teaching in 2017. He spends summers performing and teaching at Aria International, at the Madeline Island Chamber Music, and at the University of Illinois Summer Youth Music Pre-College Flute Seminar. The University of Illinois flute studio boasts a proud heritage of producing some of the country's finest musicians. Flutists are encouraged to cultivate their playing in a supportive and stimulating environment, while playing in some of the nation's finest ensembles. In addition to the wealth of class offerings a major university provides, flute majors enjoy a small school's feel with myriad opportunities to work closely with Professor Keeble. In addition to weekly lessons, flute students hone their skills in studio class, and may continue their studies through courses such as orchestral flute repertoire, and flute pedagogy. Please feel free to contact Professor Keeble if you have any questions about the program.